Love this runner. 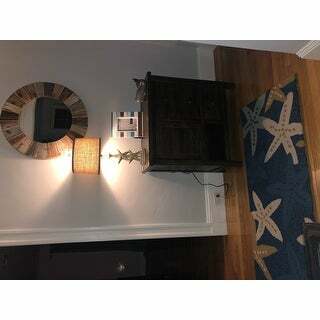 Looks great in my beach house very beachy. Colors are soft as is the rug. Very good quality. Embrace a coastal style with this indoor/outdoor area rug from Taylor & Olive. 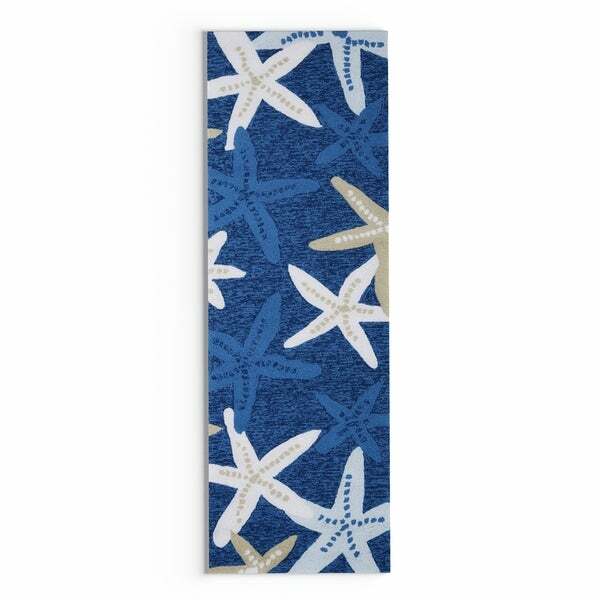 Featuring an abstract starfish design against a dark blue background, this sturdy rug brings a casual personality into your living room. Great rug with coastal flair. The picture is a true depictions of what the rug is. The rug back does have a little rubber matting but a carpet pad still might be needed on wood floors. This rug is truly beautiful the colors are brilliant blue and it feels a luxurious and soft under your feet. Sometimes there will be a slight snag or pull but it's very easy to just clip a tiny bit off the top and does not affect the integrity of the rug at all. I do not use a beater brush when I vacuum on this rug..but I've had it quite a while and it still looks beautiful highly recommend! This rug is awesome! It’s being used in my hallway I purchased the runner and just put a rug pad underneath and I’m very surprised with how plush this feels, especially since it’s an indoor/outdoor rug. I will be purchasing one for my outside deck as well! I bought this as a compliment to several other area rugs of the same pattern. The colors are exactly as shown. The colors make strategically placed accessories in white and blue really pop. Everyone notices and compliments how vibrant and beautiful the colors are. So far it is wearing very well. There have been a couple of snags that I simply cut off with a pair of scissors. This size worked great in the dressing area. The starfish design is so cute. The quality is very good. The colors in the rug is very attractive. If you have a coastal look, this is a great choice. I was completely satisfied with my purchase. This rug is absolutely gorgeous. The colors are vibrant and bright. I actually bought 2 of these to put outside near my hot tub but, when they arrived I completely changed my mind, they are now in my entry way or foyer as some call it. They need to be shown off upon entering my home and that is where they will stay. Purchase this rug you will not be disappointed in the quality and colors. 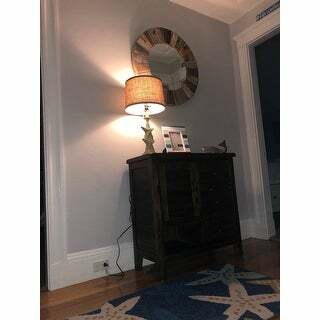 Thanks Overstock for such a lovely rug at a bargain price. Cute pattern, but ugly colors! This rug is not at all the colors shown. It's not this pretty blue and the stars are brown, not off white and beige. I can't recommend it. I like this rug, but cannot give it 5 stars because the color on the website is actually more dark or "navy" blue than the turquoise of the actual rug. Love this rug! I ordered 2 and put them on our lanai in front of our sliding doors. They add a pop of color and a place to wipe your feet before coming in! I will definitely order more for the back lanai! High quality - highly recommend! So pretty! Fits perfect in the hallway. Bought this to go with the sea life quilt set. They look awesome together, completes the look I was going for. Would definitely recommend. I really liked the length of the rug and the colors are good. This rug was exactly what I was looking for, well made, beautiful colors. It fit perfectly in the space that I purchased it for. I used this rug indoors, so I'm not sure how it would stand up to elements outside, although it does appear to be very well made. Love the look of this small area rug. I put it next to my bed on a hardwood floor & it's nice to step on out of bed on a comfy rug instead of the cold hardwood! "Please tell me how a 100% wool rug is considered an outdoor rug? I would love to buy two of these for my daughter's deck but not sure about how they hold up outdoors." The rug is 100 percent polypropylene. "What ar e. Cleaning instructions"
This item can be spot cleaned or hosed cleaned outdoors. To finish entry hall on lower level of beach house. Colors are perfect.